New analysis of the structure and function of the naturally-occurring antimicrobial agent tunicamycin has revealed ways to produce new, safe antibiotics for Mycobacterium tuberculosis and other disease-causing bacteria. Tunicamycin is an antibiotic produced by several types of bacteria, but it is unsuitable for use in humans because it is also toxic to animal cells. In a new study, researchers from the University of Oxford's department of Chemistry and the Structural Genomics Consortium, along with collaborators at the John Innes Institute and at the NIH in Bethesda, examined the mechanism behind Tunicamycin's toxicity and found that it acted upon a gene called DPAGT1, which is responsible for producing an enzyme involved in glycoprotein biosynthesis. This is a gene that occasionally mutates, leading to rare genetic diseases. By studying the interaction of Tunicamycin with this protein the team was able to understand how it acts upon cells. The researchers also altered its structure to create new analogues of the antibiotic, several of which were effective in treating Tuberculosis (TB) in mice, while also being less toxic than other drugs currently used to treat the disease. 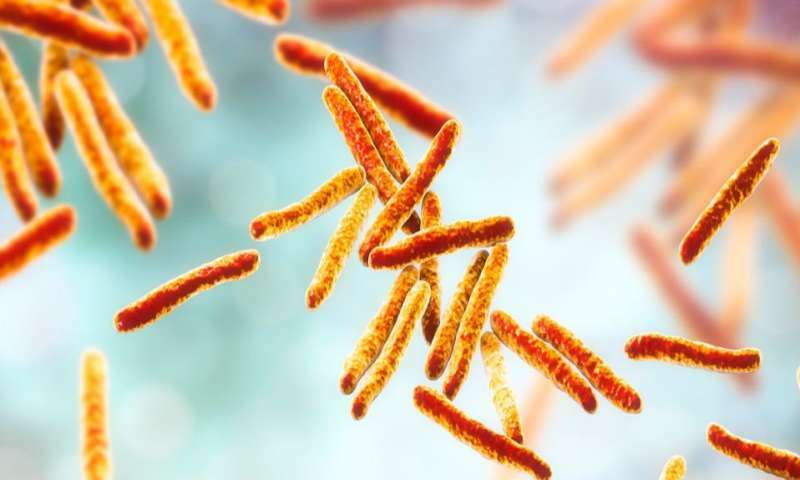 Professor Ben Davis of Oxford University's Department of Chemistry said: "TB poses a growing threat as our arsenal of drugs to treat it is rapidly running out. An exciting outcome from this work is the development of a promising new class of antimicrobial drug. "This research represents a really beautiful synergy of striking structural biology of a key human enzyme and the redesign of one of the most famous natural products in science, now redesigned to make a new family of antibiotics for TB." Tuberculosis is a disease caused by the bacterium Mycobacterium tuberculosis, which causes around 1.3 million deaths each year globally. The vast majority of deaths occur in developing countries where poor sanitation and access to healthcare compound the problem. Antibiotic resistance is becoming a significant problem with TB as many strains of the disease are becoming resistant to a range of the drugs available, and some strains resistant to all of them. Dr. Elisabeth Carpenter of the Structural Genomics Consortium and Oxford University's Nuffield Department of Medicine said: "This study demonstrates the benefits of collaborative research between teams with different specialisms in approaching problems from two sides simultaneously. In the future, being able to design new drugs in a way that ensures their lower toxicity compared with rivals represents a real game-change in the search for new treatments." The full paper, "Structural insights into tunicamycin's toxic interactions with the human N-linked glycosylation pathway allows the identification of non-toxic antibiotics effective against tuberculosis in mice," can be read in the journal Cell.